Watching the F1 cars is the main attraction on any grand prix weekend, but there is a lot more going on to keep you entertained throughout the day. The racing started around 3PM each day and went until late into the night. Between races you had plenty of other activities to keep you busy. Our view of turn 16 from our grand stand seats. 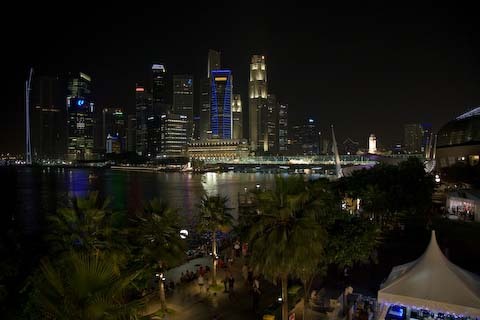 My view from the Esplanade Waterfront Grand stand. Good seats, but they were about to get better. 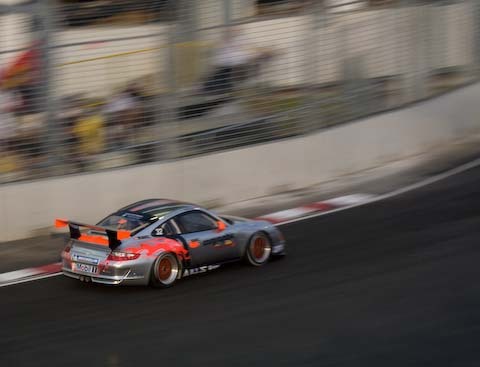 A Porsche GT3 making its way around corner 17 for a 2m22s lap. For perspective the F1 cars were lapping in the 1m44s range. 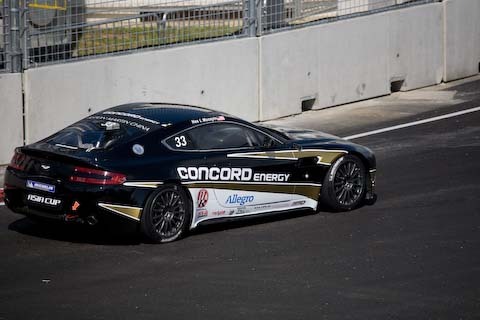 One of the Astons making its way around turn 17. These guys were lapping around 2m35s. Kangaroo TV. I can’t say enough good about this little device. 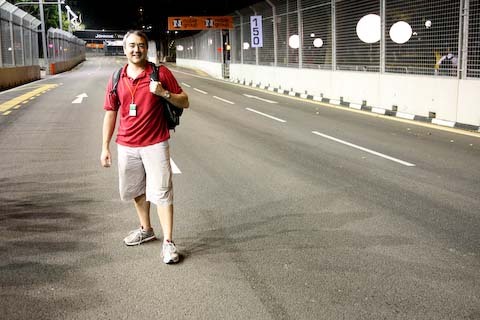 You can rent them for the weekend at most F1 circuits. 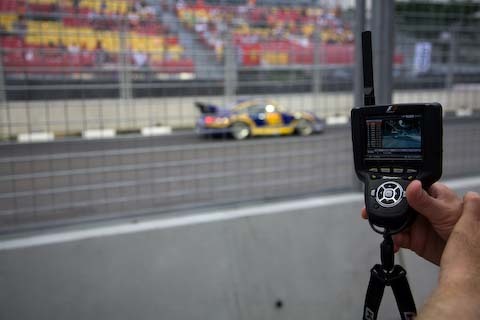 This great little hand-held monitor gives you a completely interactive experience throughout the race weekend. You can choose to watch the race from a number of different views, you can ride on-board with any driver, you can listen to pit-to-car transmissions, and watch replays at any time. Just rent it and wear it around your neck to stay constantly in touch with the happenings on and around the track. I will never go to another race without renting one of these. 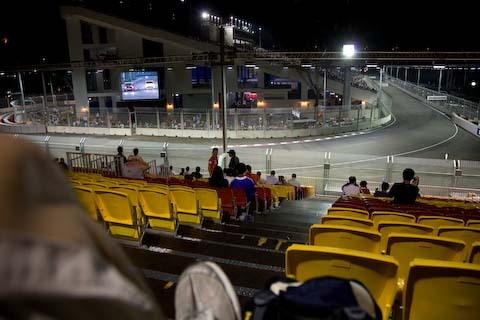 We ended up giving away our good grandstand seats for these GREAT front row seats in the general admission area. We were camped out here from 2:30PM until 11PM. Our view from the general admission area. 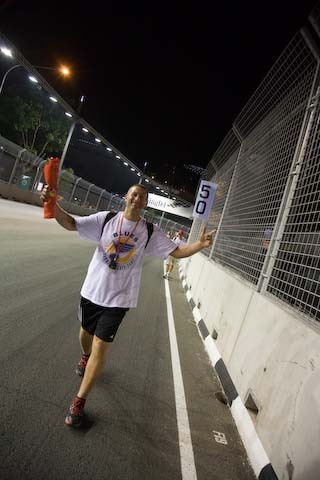 Taking to the track after the race. We headed out onto the track maybe a few minutes before we were supposed to, but how else can you get the whole track to yourself? We decided to promote ourselves to course marshals and jumped into the back of the marshal’s truck. Good Great times. Wow, that looks like a lot of fun! I’ve never followed F1, I’m more of a MOTO GP girl. That would be pretty great to see that Aston. wow! this looks like a fantastic time. as always your picture are magnificent. good to see you out having fun and enjoying the world. Hey it is around your birthday! Super happy fun time celebration to you! 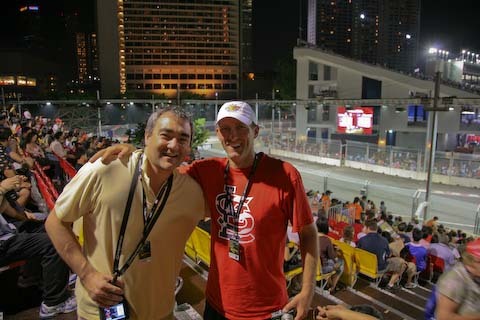 I want to go to a Grand Prix next year, this looks amazing, congrats Steve, amazing race too! Thanks for the birthday wishes. 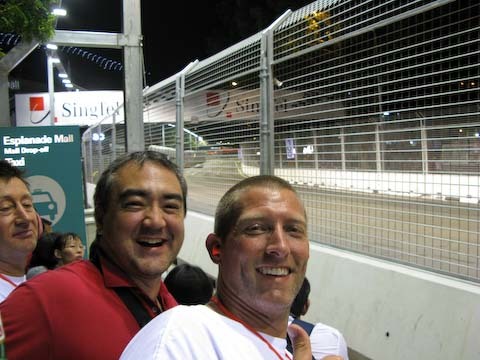 The Singapore Grand Prix was sooooo much fun. I think maybe I’ll try and go to the Japanese Grand Prix next year. You’re exactly right. 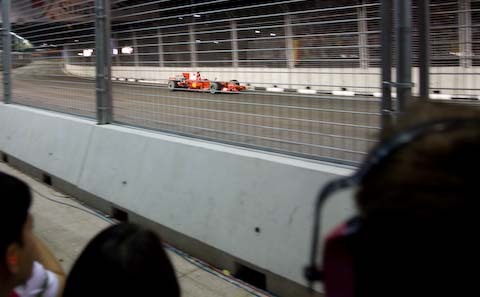 For the 2008 race we were in the Esplanade Waterfront Grand Stand. I believe it was row 28 or 29, Seat 1, 2, 3. We ended up giving our grand stand tickets to a family with general admission seats because we found a general admission spot that was even better than the grand stand seats. The only problem with that is we had to stake out the seats way in advance and plant ourselves there all day.